At the White Oak Manor bed and breakfast we strive to serve a great breakfast every day. We feel that breakfast is one of the best things about an East Texas Accommodation and you shouldn’t leave for your outings on an empty stomach. 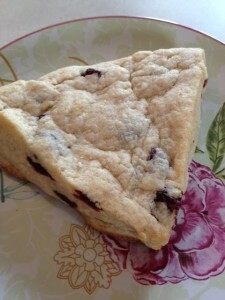 I like scones and have been trying to find a really good recipe to serve and share with our guests. Last night I was on the hunt for a recipe to use the delicious dried cherries I had bought. I wanted a scone that was not to dry and had a good flavor to it. I found one on the Cooking Network site that fit my taste perfectly and not much of a surprise here that it is a recipe by Anne Burrell. I love watching her shows so I really shouldn’t have been surprised at all. Since we serve breakfast to many types of people and we never know for sure if they may be allergic to nuts so we don’t add nuts to any of our dishes. Next time we are making them for ourselves I will add the almonds. I didn’t get quite as ambitious as Anne so instead of making homemade butter I whipped premade butter with the honey and it was mighty tasty. Preheat oven to 375 degrees F. bake for 17-18 minutes. Form the dough into a 1-inch thick disk and cut it into 6 wedges (I think you could easily cut 8 wedges and have enough for everyone). Sprinkle each wedge generously with the turbinado sugar. Transfer the wedges to a parchment-lined sheet pan and bake in the preheated oven for 17 to 18 minutes, turning the pan halfway through. Serve warm with Honey Butter. The scones were so rich, moist and buttery I relished every single bite. I truly believe this recipe would make a great base for just about any thing you’d want to add to it. Next time I’m going to use dried blueberries and maybe some white chocolate bits for a little fun.